Did you know that Pepperidge Farm Puff Pastry is MSPI-friendly? Isn't that fantastic?! It literally opens up a world of possibilities in the dessert-making department! 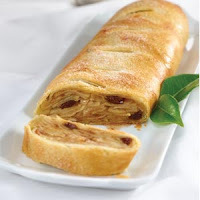 One of my favorite apple desserts is a strudel, and since I love to use short cuts when possible, puff pastry makes the strudel so easy! Here's a recipe from Pepperidge Farm that I like to use. If you want to make your life even easier, follow this recipe. It uses apple pie filling. Hi there, My son was recently diagnosed with MSPI, so we are making the lifestyle change now. Your website is so wonderful. Thank you so much for sharing your great recipes!! Can you recommend a MSPI safe chicken broth?? I'm having trouble finding one. Do you have a list of common MSPI safe foods you purchase from the store? I'm finding that labels don't always list everything. Thanks so much!!! Hi Jessica. Welcome to the site! I'm glad you found it! I believe many of the fat-free/low sodium broths are safe. I honestly don't use cans of broth. My mom was kind enough to make a bunch of broth and can it for me, and I use that. I also use Knorr bouillon cubes, which are MSPI-friendly. Here are a few items that helped me keep my sanity those first few weeks on the MSPI-diet (keep in mind that I can have soy lecithin/oil): Fritos corn chips, Oreo cookies, peanut butter, Lender's whole wheat bagels, pasta, cereal with rice milk, licorice. Of course, double check the ingredients before buying! The first month is the hardest, but it does get easier! Good luck!